Last image contains a complete inventar! 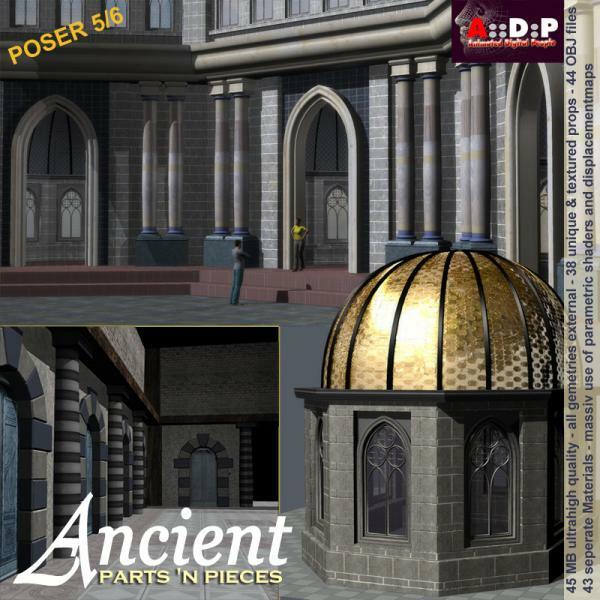 Ancient Parts 'n Pieces (P5/6/7) is a collection of 38 Poser Properties to build scenes. All geometries used by the properties are stored in a seperate folder (runtime/geometries/ADP Ancient PartsNpieces), so you are able to use this geometries with other 3D software. Most of the groups in the OBJ-files are intact. Beside of the props there are a lot of ready to go Poser materials in the package to play with. With this package, you will get 45MB content in 206 files. I've crafted 'romanesque' stuff in TurboCAD, but this is in a totally different league. DisneyFan (4 years ago) Inappropriate? Thank you so much! You just rock! freewindfairy (7 years ago) Inappropriate? thank you for sharing this great set! Thank you for the beautiful work on this and your other props! Really amazing work and just what I have been looking for. What an incredible place this is! There are so many features and textures to choose from I will use this one for a long time to come. Your renders of it bring out the fine potential there. Thank you so much for this wonderful gift. A::DP (9 years ago) Inappropriate? After a longer break, I've decided to upload some more fresh Poser items soon. This looks great. I can't wait to try it out. Thanks. Thank you, this is beautiful and very very useful. And versetile! I love the eastern influence. Thanks for sharing this awesome set!! Indoda (10 years ago) Inappropriate? Das ist von Ihnen sehr gro�z�gig! Viel danke! Very nice! Thank you,once again! Thank you! Some of my most favorite Poser models come from your freebies - this is wonderful, you always post something interesting and useful in so many different ways! Heather Parkes (10 years ago) Inappropriate? Can't wait to try this out! Thanks! What a package, and all for free, marvellous! CHEERS! graykeeper (10 years ago) Inappropriate? Thank you for this really nice package. There is some very fine artworked included. Thank you for sharing!